Rebalancing frequency, Implied Volatility & Rho. Dynamic Delta Hedging Applications. a) What is the impact of rebalancing frequency on hedging profitability? 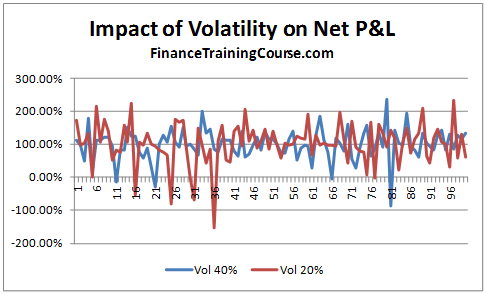 b) What is the impact of a rise in volatility on profitability? How does implied volatility help in interpreting this change? c) What is the impact of changes in risk free rates on profitability? d) How does the interaction of time to expiry and volatility changes profitability? 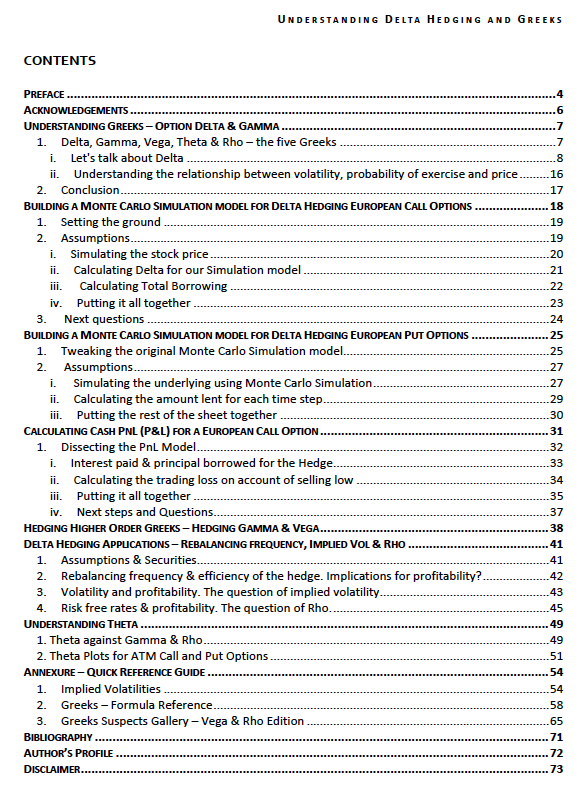 These are all questions that should occur naturally to you as you spend more time with the Delta Hedging model. 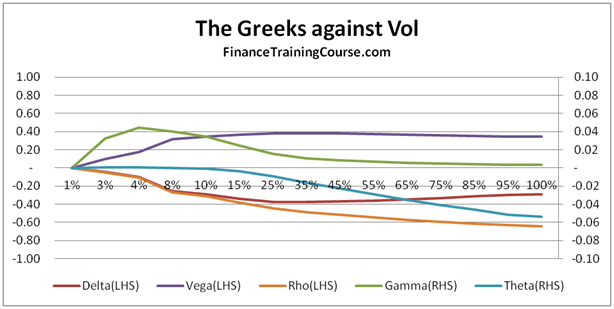 They are also essential to building a deeper understanding of the concept of implied volatility, Rho & Theta. Rebalancing frequency & efficiency of the hedge. Implications for profitability? A good hedge is one where the cost of the hedge is close to the theoretical value of the option. 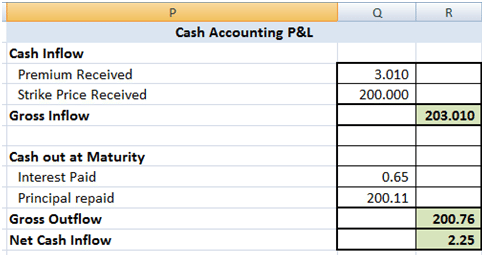 In our cash accounting P&L we have included the theoretical premium received which is used in determining the initial amount to be borrowed. Hence for a hedge to be considered good or efficient the Net P&L should be close to this premium amount. From a trading point of view there are two lessons here. First the large variation in P&L linked to jump’s in the underlying price is the un-hedged Gamma at work (Is that true? Think about it). Second would you prefer to limit the cost of hedging the option to the amount you have charged your customer or less? If you are in the business of earning a living from writing options, the premium you charge on the options you sell should always be higher than your cost; your cost of effectively hedging the option. Now back to the Gamma question. Gamma is your second order error term. Conceptually it’s similar to convexity and linked to changes in not just the underlying price but also volatility. 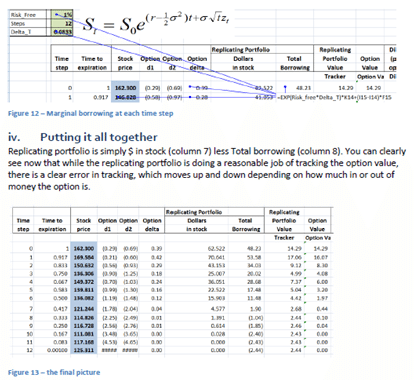 Is your true P&L (the premium received less the actual cost of hedging) is the summation of the hedge error? With volatility there are multiple questions. How does profitability change when the general environment moves from low volatility to high volatility? 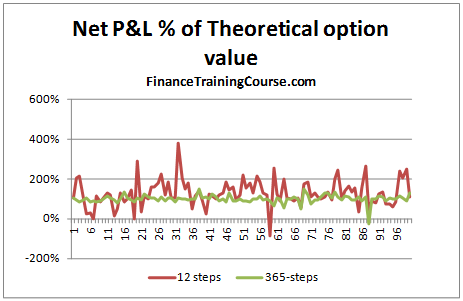 How does profitability change when you have already written an option and volatility moves for or against you? Let’s start from the first question. 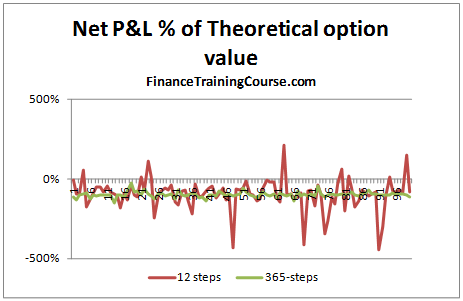 Using the 12-step model we calculate the impact on Net P&L. In our base case we have assumed a volatility of 20%. Let us now assume that the volatility increases to 40%. What is the impact on hedge efficiency for options written in the two different environment? So premiums are clearly higher and so is profitability in absolute terms. But is that true in the relative world? Let’s take a quick look by plotting the Net P&L to Theoretical Value across 100 simulated runs. In relative terms (as a % of premiums) there is not much difference. Why is that? Is this a result you expected? 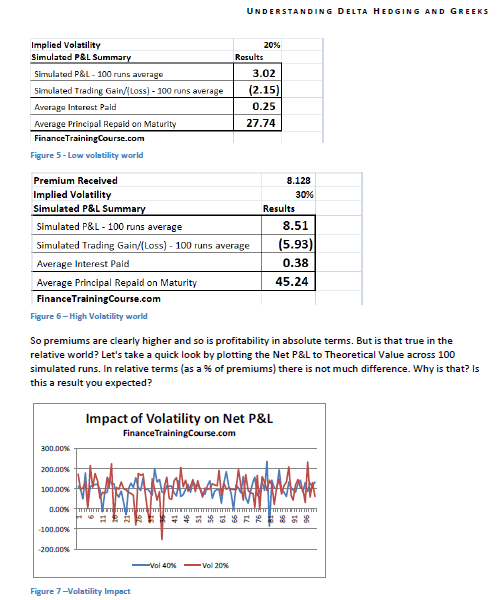 To answer these questions you have to revisit implied volatility. Let’s use the same scenario as above but with a minor change. We wrote options and received premiums assuming an implied volatility of 30%. The actual realized volatility over the life of the option was 20%. How did that change our resulting simulated P&L. You can now see a clear difference in absolute as well as relative terms in net P&L. And the difference arises on account of the spread between the premium charged ($8.13) versus the premium needed ($3.01). 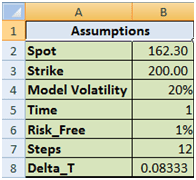 (To run this exercise using the Delta Hedge Sheet, simply calculate the value of the premium at the implied volatility level you want to charge and replace the original premium in the simulation with this value). 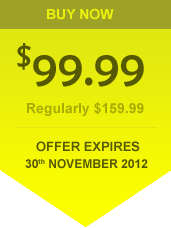 Risk free rates & profitability. The question of Rho. We present the results of three P&L simulations runs in the tables below. The first assumes a risk free interest rate of 1%, the 2nd uses 2% and the third uses a risk free interest rate estimate of 5%. The first two are easy, rates go up, premiums goes up and a European Call option becomes more expensive. Why is that? In addition to borrowing the difference between premium received and Delta hedge, the other usage of the risk free rate, r, is in estimating the future value of the underlying asset in the BSM (Black Scholes Model’s) risk neutral world. This implies that there are other components of Rho, in addition to the borrowing cost. That you need to examine and be comfortable with. 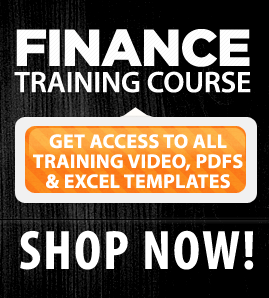 In earlier posts we have set the foundation for hedging in practice. 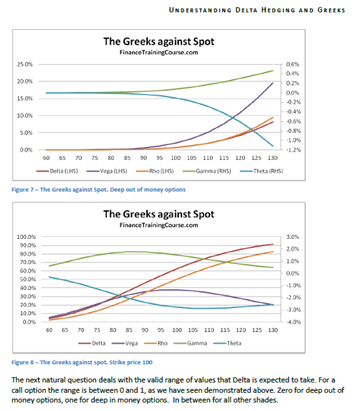 We did this by calculating Option Price Sensitivities (Greeks) and Delta hedging for European Call as well as Put Options. Why would you want to hedge Gamma? If you leave it un-hedged you are exposed to the risk of large moves, especially when the option is at or near money. When you are deep out or deep in, Delta is flat and asymptotic as shown above. But when are you not, a large move can result in significant trading loss despite being Delta hedged. As long as prices move in small increments and do not jump dramatically, Delta hedge will cover you. The underlying jumps, you are exposed. We have seen this at work earlier with duration and convexity with similar implications. 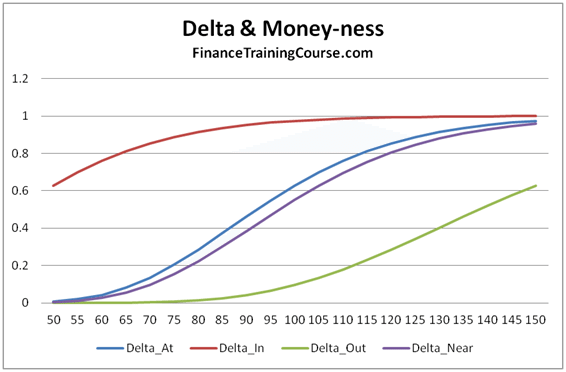 Delta is the first order rate of change and works well within a narrow band. Within and outside that band Gamma tracks not just the error but also the magnitude of your gain/loss in case of a large move (up/down). The magnitude of the error shifts dramatically as the option gets closer to the At/Near money state. 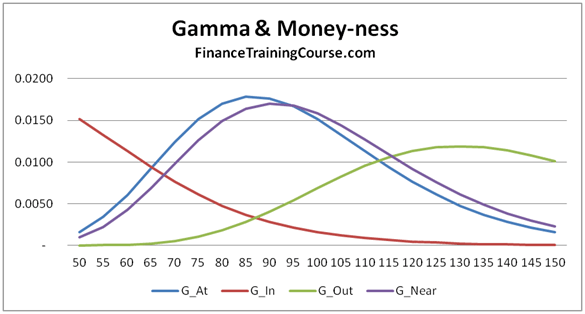 When options are deep in or deep out, similar to Delta, Gamma also flattens out. However given the convex nature of the 2nd derivative in this case, the impact of a large up move or a large down move is not symmetric. 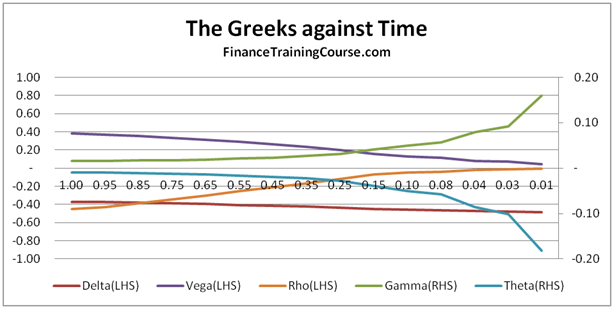 But you can’t hedge higher order Greeks (Gamma) by buying or selling the underlying. Why not? First the 2nd derivative of a spot/forward/linear position is zero so hedging Gamma through the underlying is out. 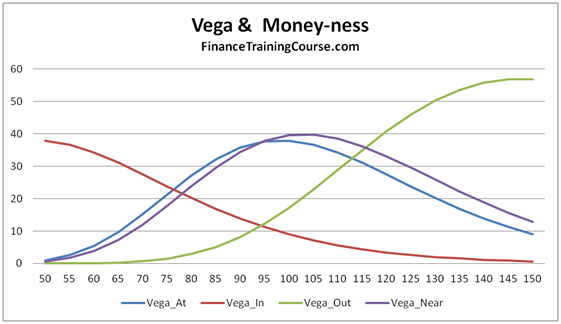 The second complexity arises with Vega. We really don’t know what shape or form realized volatility will take in the future. How can we effectively hedge it? Then there is the issue of term structure of volatility. 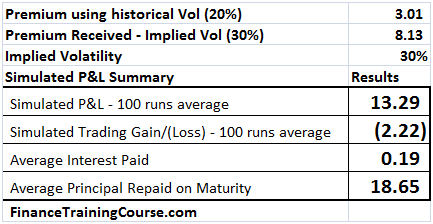 Implied volatility changes based on time to maturity (term structure) as well as money-ness (deep in, deep out, At/Near – strike price) so taking a simple constant volatility view across all options irrespective of maturity or money-ness would actually be in-accurate. 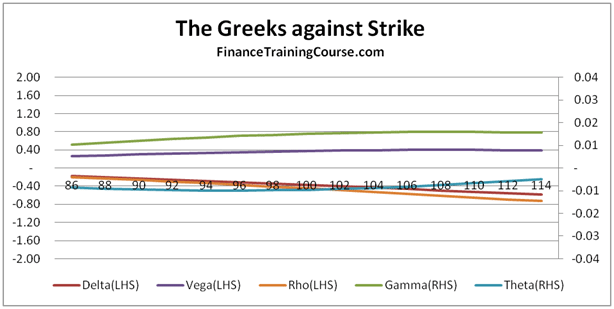 The third catch is that both Gamma and Vega use exactly the same calculation function for Calls and Puts (Gamma for a call and put has the same value, Vega for a call and a put has the same value). Which creates interesting implications for hedging a book of options with calls and puts. You may be perfectly hedged and squared with respect to your Gamma and Vega exposures but the wrong universe/direction of hedging choices can still wipe you out. 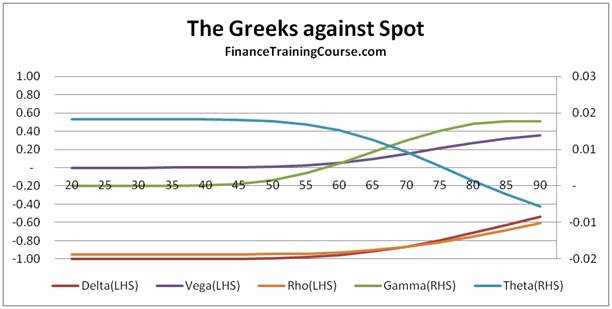 We hedge Gamma and Vega by buying other options (specifically cheaper out of money options) with similar maturities. Like Delta hedging we need to rebalance but the rebalance frequency is less frequent than Delta hedging. Your final hedge is therefore a mix of exposure to the underlying (partial delta hedge) and cheaper options with similar maturities. The only question is that it’s a large universe of options out there, how do we manage multiple constraints including premium & sensitivities across products, maturities (tenors), Delta, Gamma & Vega. The answer is constraint optimization through Excel solver. In our next post we will show how to build a simple Excel solver model that takes a universe of four options and uses it to match the required Delta, Gamma, Vega profile for a single option. 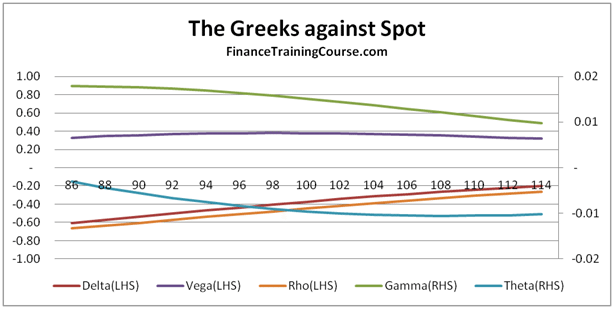 Before we jump to the next post, please review the following background posts on Option Greeks & Delta Hedging to ensure that you are comfortable with the calculation of Delta, Gamma & Vega as well the implementation of Delta Hedging in Excel. 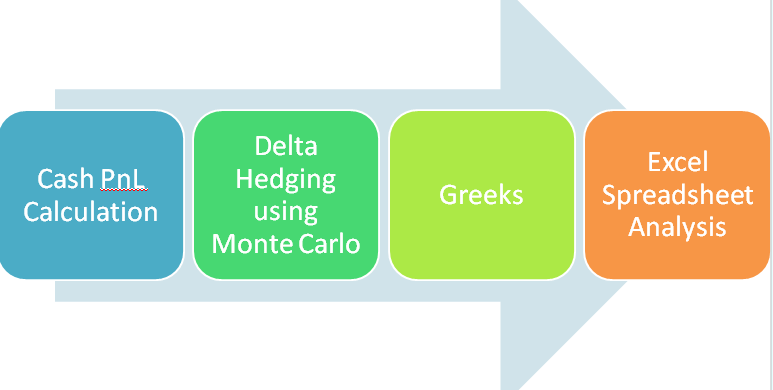 As part of our Sales & Trading technical interview guide series we have done a number of posts on Greeks, Delta hedging and estimation of Delta hedging Profit & Loss. 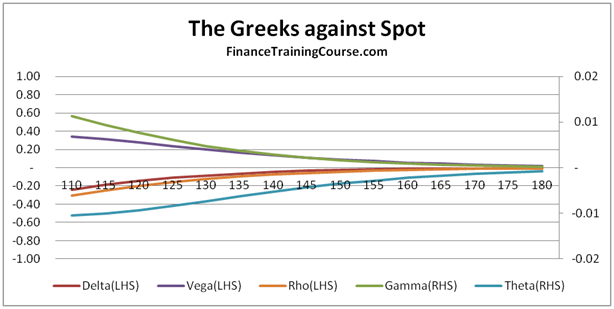 A recent client/student/interview request indicated a preference/need for a sheet dedicated to European Put Options Greek plots. Hence the Greeks Put Option suspects’ gallery. While some of these are making a second appearance, we think a Put only collection is indeed useful given our focus on European Call options. 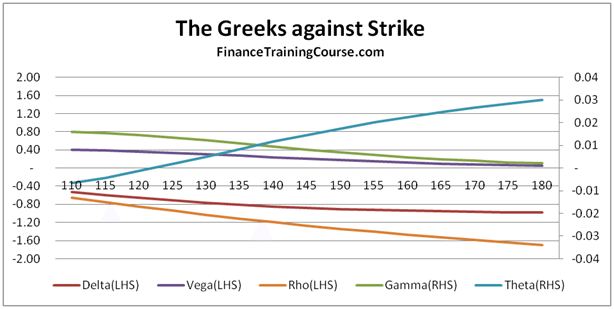 The Analysis framework used for dissecting put option Greeks is simple. We break the contracts down by “money-ness”. The three categories are Deep In, At/Near, Deep Out of money options. 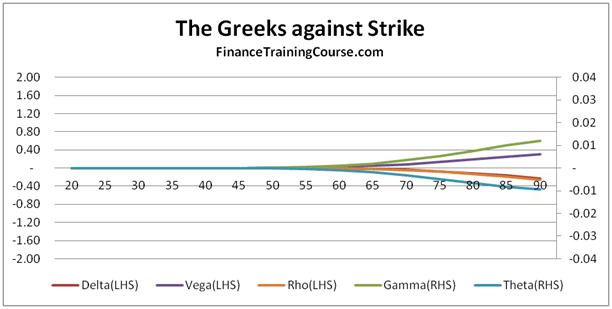 And the five option pricing variables – Spot, Strike, Vol, Interest Rates & Time. This analytical combination produces interesting results. November 2, 2012 by jawwad·Comments Off on Keep a tab on the odds for the US Presidential election. Who is winning? A bet?